The prime minister’s newly inaugurated ministerial team is a third smaller than the previous government. Merging ministries like coal and power will enable Narendra Modi to quicken notoriously slow decision-making. That’s key to sustaining investors’ revived confidence. 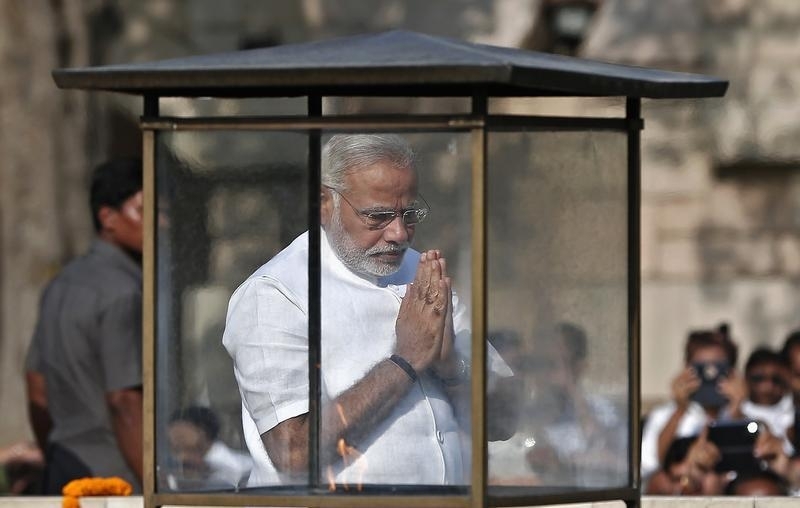 Indian Prime Minister-designate Narendra Modi prays at the Mahatma Gandhi memorial after paying the flower tribute at Rajghat ahead of his swearing-in ceremony, in New Delhi May 26, 2014. Narendra Modi was sworn in as India’s new prime minister on May 26. Besides him, 45 other members were inducted into the new council of ministers. Unless it is expanded, the new cabinet will be a third smaller than the 71-member-strong Congress Party government, which lost the election. Arun Jaitley, a former commerce and law minister, will be taking charge of finance, corporate affairs and defence, Reuters reported, citing a government statement. Piyush Goyal, a former investment banker, will be the minister for coal, power and renewable energy. Narendra Modi himself will control atomic energy, space and any ministry not allocated to a cabinet colleague.